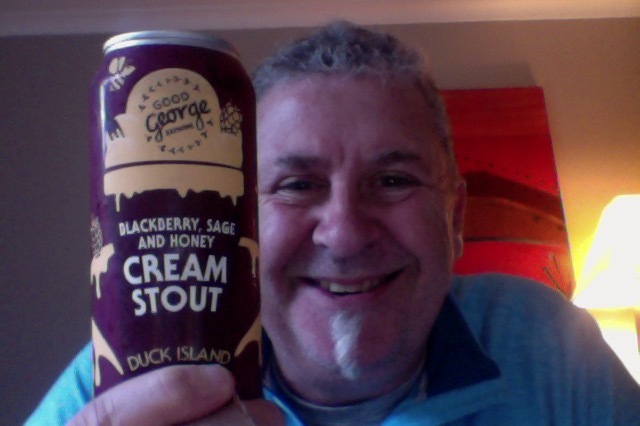 Good George Blackberry, Sage And Honey Cream Stout. You read that right, it’s a stout with a herb garden added. Actually it’s a Stout with an ice-cream recipe added. They’ve done this kind of thing before have Good George, so this isn’t as odd as it seems, although it is as odd as it sounds. This is a beer that is 5.2% ABV and at the 24 IBU level, making it about and 158 calories a service size, this can on 440ml is around 1.7 standard drinks in NZ. A collaboration with local ice cream heroes Duck Island, this is our version of their popular ice cream flavour. Smooth, rich and roasty with a hint of sage and lingering berry flavour. I brought a new glass, an op-shop find, so it’s inappropriate but it’s new to me and so making it totally appropriate. Mostly is smells like a chocolate stout, and then theres a dash of a sage or rosemary in there. It has prickly bitterness, and it’s not very full in the mouth and lacks a bit of middle softness and sweetness is my first impression. Any my second. I think this is a beer with good intentions, because it’s obviously so. But I think it’s not well executed. Good George seem to veer towards odd stouts for a reason that might not be obvious to an outsider like me, but I think that it’s not a style that lends itself to subtle things like honey, where you’re poking in amongst dark roasted malt or barley to get that stout thing happening. This is rather a bit of a miss. Might go down well on the beer expo circuit where you get small cups to try, but in the larger form, at home, the shortcomings are somewhat more obvious. Not having had, or heard of, the aforementioned Duck Island Ice-Cream, which I’m sure is really nice, it’s hard then to be informed or get a measure on if this is a success or not. I’m going with not based on what I know and have in front of me. It’s not an awful beer, but aside from that sage hint there’s not a lot else to engage. As to the Blackberry, perhaps they meant just the one, because that really is conspicuous by its absence. Which takes me back to another beer, the Bhang Thandai I had. These are flavours that you don’t get regularly, or often enough for you to be able to measure them in a different setting. You rarely get Sage unless you particularly like a stuffed chicken, and who’s had Ribena lately? The pdubyah-o-meter rates this as 7 of its things from the thing. I wanted to go 6, but this isn’t awful beer to drink, it’s just pretty much a stock stout, with a hint of a different aroma. Personally I would have gone for a bigger beer, with more underlying bitterness and worked to balance that out, this seems to be a race to the middle, and that’s a bit mediocre. Where did I get it? The local Liquorland. Am I enjoying it? Not for what it is described as, otherwise it’s passable. Would I have another? Not unless they re-work it. Would I share with a friend on a porch and set the world to rights? No. Nothing to see here, at all, move along. Unless you brought the aforementioned ice-cream to have with or besides in a parallel tasting then it might be more obvious. Unlikely though. A bit different for me, but there is some extraordinarily good music on this. 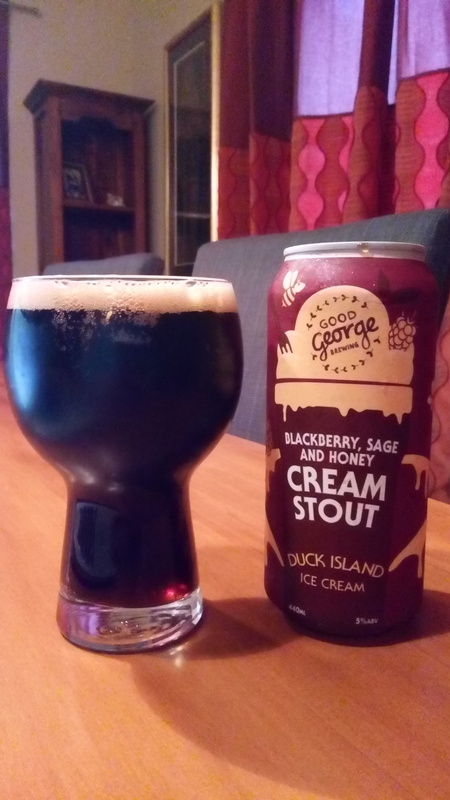 This entry was posted on August 12, 2017 by Philip Walter in Beer, Beer of New Zealand, Beer Review, Brewed By, Craft Beer, Critic, Good George, Sweet Stout and tagged Blackberry Sage And Honey Cream Stout, Canned Craft Beer, craft beer, Good George Blackberry Sage And Honey Cream Stout, Good George Brewing, Ice cream, Led Zeppelin, Sweet Stout.